The author’s website is the perfect blend of a personal and professional website. This isn’t a classic marketing site. It’s about a specific individual: you, the author. It is a place where you interview yourself and answer the big questions. Who are you? What’s your topic? What have you done? What do you write about? What do you believe? What do you stand for and against? Here are ten simple tips for creating a better website for you, as an author. Here’s how to create a site that informs, teaches and connects with an audience. Your site is the Wikipedia page about yourself. And just like a Wikipedia page, it should be the best page on the internet for that specific topic, that certain someone: you. It should have everything about you and your writing. The most important info should appear both on the homepage and in your biography. There should not be a better page online anywhere – not LinkedIn, not your university’s website, no author bio or media interview – that exceeds your own website in depth of information. If there’s content about you somewhere else that doesn’t also appear here, you’ve got a content gap to fill. Remember, your visitor is interested in you, the author, of they wouldn’t be here. Why else does someone visit an author website? They came to satisfy an information need. They have questions about you. They want to connect with you. Are you going to be presenting somewhere? Doing a reading? A book signing? Are you teaching somewhere? Where and when will this next appearance be? On the radio? Behind the podium? Each of these opportunities for the visitor to connect, attend, watch and listen should be here. The site can also include past events, which can be evidence of legitimacy. It’s a place to post the video, the photos or screenshots from happy social media posts. Is sounds obvious. 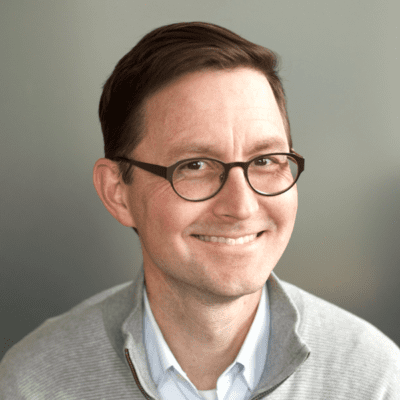 A picture of your face, a professional headshot, helps the visitor connect with you as a person. If you don’t have a picture of yourself on your site, visitors are just not going to feel as close to you. Faces are an all-powerful type of image. It’s hardwired in the brain. From the time we are born, we gaze at faces more than any other type of imagery. So to leverage that built-in cognitive bias and make sure you are on the site. Not just on the About page, but on the homepage. Invest in a bit of professional photography. Make the picture descriptive. Show yourself and context. Be a real person. Consider these 9 tips for a better profile picture. You can even test your profile picture with a small focus group. It doesn’t have to be super polished, but it does have to be authentic. Authenticity is more important than production value. The site has the warmth of your personal brand. It has your face. For the next step, invest a few minutes in a personal welcome message. Turn on your laptop or phone camera and make a tiny video of yourself, introducing your project, your book, yourself. Why are you doing this? Why does this exist? What problem does this book solve? Why does it matter? Who is it for? Why should web visitors pick it up? Some marketers have learned that they get greater visibility and awareness if their process for creating things happens in public. It’s not ideal to lock yourself in a room, write a book, then suddenly release it to a world where no one was expecting it. A far better approach is to share the process during the process. There’s the book, and then the story of the book. This meta content often helps the audience feel more connected to the content and to the creator. What challenges all your working on? Who are you including in on this? Are you traveling somewhere for research? What does it place look like or feel like? Who are you citing or mentioning? Sharing progress also gives visitors a reason to come back to this website. They may want to know how things are coming along. And when the book launches, it’s not a total surprise. They know and care already. This approach makes you more human. Remember, people don’t like perfect people. Don’t try to be perfect, just try to be human. 6. What social media websites to link to? Another positive outcome from a visit is the social media follow. Successful authors are often very good at growing an engaged audience on social media, and the author website supports that goal. Where am I on social media? Do I really have to be on social media? What networks should I use? The answers lie with your audience. So where is your audience? Are they active on Facebook? Twitter? Instagram? LinkedIn? You don’t have to be everywhere. Decide where you will be active, then commit to and invest in that social network. And that’s the social media website you link to from your website. That’s where you suggest that people to follow you. Do don’t add social media icons for a social network unless it meets two criteria. I am actively engaging with people on that social network. I am listening. I’m responding. If you’re sharing content and you’re listening and interacting on a network, then it makes perfect sense to link to that network. A list of engaged subscribers gives you the power of self promotion. It will help you launch your next book, get feedback, reviews and sales. The key is that little signup box. It stands out. It’s colorful, big, or it may even be a pop-up window. 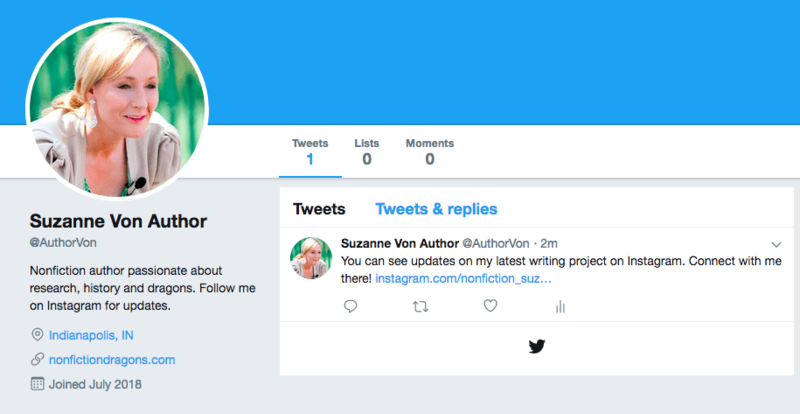 The author website can be a home to republish any review from any source: Twitter, Amazon, LinkedIn recs, back covers and letters of recommendation. And the more the better. Fill your website with quotes and reviews. 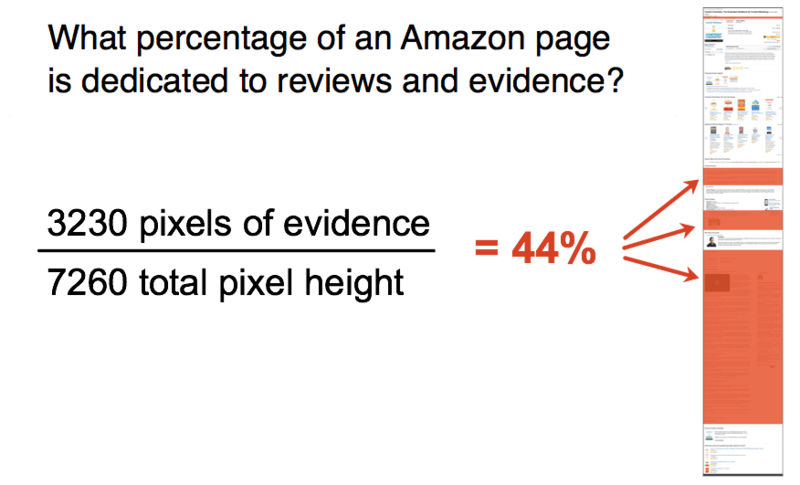 I once analyzed a book page on Amazon, and found that 44% of the page was reviews and evidence. They are good at selling books. You can use this trick by filling your own site with reviews and happy words from your readers and customers. Warning! Don’t make a separate “Reviews” page. If visitors have to click to get something, they are far less likely to see it. Make every page a reviews page. Put your best reviews on your most popular pages, starting with your homepage. Even better, capture a video clip of someone talking about your work. The video testimonial is super powerful marketing. If you ever spot a video review on social media, you can embed that into your page. ProTip: You can create video testimonials by bringing a camera to your book signing. It’s not easy to get people to talk on camera, but if you can ask a superfan to politely say a few words, you’ve got marketing gold. The visitor is far more likely to do something if you suggest it. A few words in a little button or link can mean the difference between fame and fortune …and hearing crickets. “Contact” is not a call to action. It’s just a button that brings the visitor to a contact page. It doesn’t suggest or trigger anything. What makes an effective call-to-action? VERBS. Here are some examples. Do you want to be invited to be a guest lecturer? Or to collaborate on a project? Or be included on some research? Or contribute quotes to the media? Remind the visitor that you are open to that possibility here in the universe. So try, “Book me to speak at your next event,” “Are you from the media? Contact me for contributor quotes!” Or, “Connect with my agent,” reminding the visitor you’re in high demand. One of the goals of your website is to get the visitor to take an action that will benefit you, the author. This is much more likely if you include verbs strategically, putting calls-to-action through the site. “Buy” is the ultimate call to action. If the visitor clicks this, it’s pay day in a small way. Book sales are a measurable, monetary outcome. Ecommerce involves set up costs and monthly fees. Handing shipping requires customer service and packing tape. 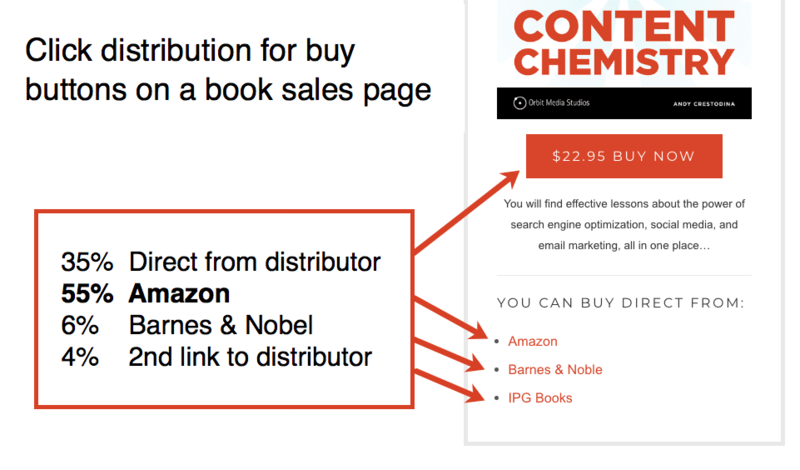 Most authors prefer to spend their time and money on writing books, so the classic author site sends the interested visitor to other sites to buy. Where to send them to buy? If you’ve got strong reviews on Amazon, you might send visitors there. Your readers have been to Amazon before. They know that it’s easy to buy and delivery is fast. If you have a distributor, you might send visitors there. You might get a higher margin there. If you have an audio version, you might send visitors to iTunes or Audible. Whenever possible, give visitors options. And don’t assume that the biggest button will get clicked the most. The biggest buttons aren’t always the most clicked. Some people really want to buy on Amazon. ProTip: If you send people to Amazon, take a few minutes to set yourself up as an affiliate. This will allow you to collect a small commission from the customers you send to Amazon. When your visitors buy on Amazon you’ll get a tiny little kickback. When you tell the world that you’re a real person, that you’re listening, that you’re interacting, that’s when author website transcends the monologue and goes straight into dialogue. It is an open invitation to interact with you. It is the best thing about the internet: it’s a place where people make real connections. It’s not just a place to put an online brochure. There are people who are searching for you and the things you know right now, as you read this. At this very moment, they are looking for you and your content, and the insights in your head. That’s what books are all about. That’s what websites are about. It’s about getting the stuff out of your brain and out there into the world, on paper or in pixels. That said, we hope this connected. Thank you for reading.